When I look back over the past twelve months of Challenges, answers, comments, and discussion, I see a rich back-and-forth between readers (some of whom are active commenters), me, and the world at large. I mean, look at the range of topics we've investigated! We've talked about everything from why an island in Fiji seems to be missing (January 3, 2018) to deep investigations about why a piece of real estate in San Francisco seems to be unusually shaped (February 28), to how large seeds are dispersed (June 2), and why a stream in Austria seems to flow uphill (July 25). These are all amazingly curious observations about the world; things we notice that drive our curiosity and our research. What I find so much fun about these Challenges (and frankly, the discussions that come out of them) is the incredible range of topics that attract our interest, and what we do to discover the answers. As you know, that breadth of curiosity is important to me--I firmly believe that people with a curious outlook on life know more, do better work, and are generally more interesting! You are definitely all of these things. The SRS blog started in 2010 as a way for me to share insights about how to do effective online search. Along the way, it transmogrified into ideas for a book on this topic--running title: The Joy of Finding Out. As I mentioned earlier, the book is happening! I just got the publisher's copy-edits! Once I accept (or challenge) them, they'll print up a galley of the book, and that's the last pass. After the galleys are accepted, the thing gets sent off to the printers! The expected due date is early summer, 2019. I'll let you know more about the book when it gets closer to publication date--but I want to let you know that all of you, the loyal SRS readers, have played an important part in the process of getting this book into print. So, as we begin a new year, I wanted to be sure you all know how much I appreciate all of you. Your intrepid research skills are amazing, and the discussions we have in the comments are wonderful. Thanks! Have a marvelous New Year! I'll see you soon, back here, in SearchResearch! ... and so there are a lot of cranes in the local Google landscape, including a bunch of very tall, very large, and very odd ones. So I was surprised when I saw tall poles on the construction site with what looks like wheels on the top. The obvious question: "What are these things?" Here's the original picture, and a closeup of what look like big bicycle wheels at the top of several of the vertical posts. This is my original photo, taken on a run past a large Google construction site. How about these pictures? In this one, you can see the wire ropes going up into the wheel--so we now know it seems to be something more like a reel (or spool). 1. What are these mysterious wheeled poles called? Why are there wheels on top? What do they do? I got it before you posted this better image just now. A "strand jack" recoiler. From Enerpac (heavy lifting technology company). The scene you showed looked to be construction of an arena with an inflatable roof system; there are 8 of those wheely units around what I thought to be the roof cover. Spaced, I thought, just so, for that purpose. So off I went with "construction crane parts" then I wanted to know how tower cranes extend and retract. Then sidetracked by ROOFLIFTERS and how entire solid roofs are lifted. and then sidetracked again by Tottenham Hotspurs on Instagram "roof lift" -- it's then that I see the first notice of a thing called a "strand jack"
Hmmm... Whats that? Then did a search for [ how strand jacks work ] finding lots of hits and leads. Then I ask [ strand jack recoiler ] which seems to be those wheels. I also tried to find why the re-coilers are tipped. but could not find explicit reasons. So, back to my days working around wire rope and cranes and spools and winches. I think tipping helps to keep the strands clean and allow the natural lay or tendency of the strands, which are now not under tension, to lie in a natural way which also kept the pressure on most of the strand to not unwind. So, what you (Dan) asked about are the recoil wheels. As the cable is pulled the excess can be wound around the wheels you see. Going the other way the wheels with strands of cable feed the jacking system. Used for very heavy lifts apparently. Great way to spend on hour on a rainy rainy day. In my case, I futzed around for quite a while with combinations of search terms like crane, tower, wheels, etc.--mostly not finding anything. But then I found something interesting. Here's my recap of what finally worked. 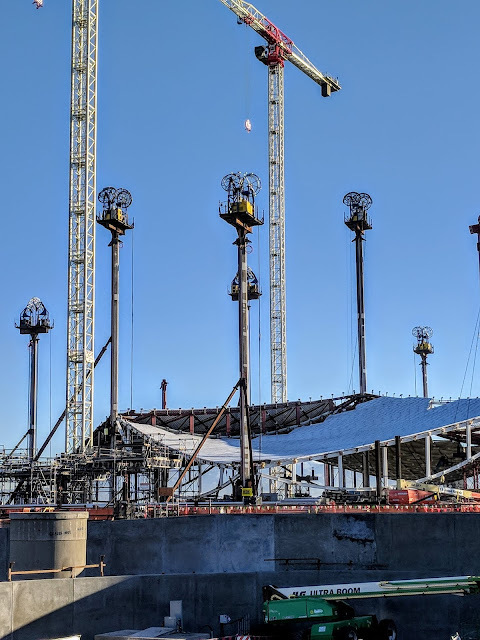 In the process, I noticed that a couple of the roofs were being lifted by hydraulic jacks. 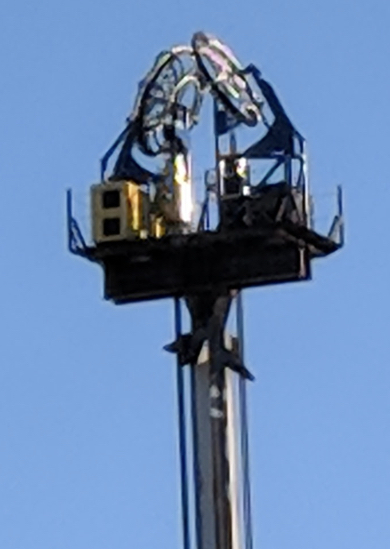 This was my ah-ha moment: "maybe," I thought, "this isn't a crane at all, but some fancy jack thing..." Could it be a hydraulic jack on a tower? The first place I saw "strand jack," in a diagram from the Dorman website. Those reels and cables look a lot like the images above, the ones that caused the original Challenge. And there's a terms that's new to me--strand jack. What's that? 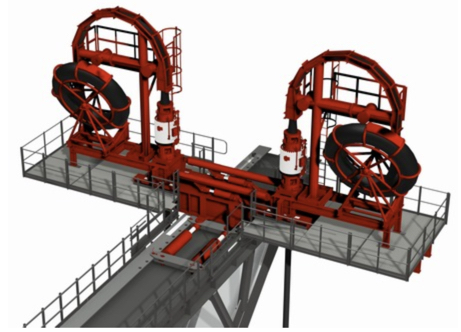 In particular, this sounds about right: The strand jack is a way to lift heavy loads with multiple jacks for construction. What's more, the yellow cylinders I see in the construction site images look a lot like the image above. Now that I know this, this image now makes sense--these towers are strand jacks that will pull up the roof, a little bit at a time. A close up of a strand jack at the construction site. The cables go below and attach to a corner of the roof. Then, controlled by a master computer, all of the jacks lift their corner of the roof in parallel. As you can see in the pictures below, the roof IS moving upwards! It's a bit like pulling up a weight attached to a rope by hand. That is, you pull up with one hand, reach down, grab the rope with the other hand, pull that part up, and repeat. Here's a wonderful animation from the Wikipedia article on Strand Jacks. Strand jack animation from Wikipedia page. The red clamps hold the blue wire strands at both top and bottom, releasing the bottom and lifting up, then closing the top, then opening the bottom to effect the move. The orange hydraulic fluid is what does the magic. Put 13 of these side by side, and you can lift mountains (almost). quickly led to some useful images, like this one from Dorman showing the relationship between the strand jacks and the excess cable takeup reels. Here you can see the cables coming up from below, passing through the strand jack, and then up and into the takeup reels. And, as Jon found out, these are often called "recoilers." Know we know: The "wheels" are recoilers that take up the excess cables from the strand jacks that are (literally) doing the heavy lifting on this roof construction project. And, here's a great video showing the strand jacks pulling up a very heavy load (a section of the new Oakland Bay Bridge), and the recoilers being used. (I didn't know the cables were wound up by hand, or as you can, by foot. In any case, there doesn't seem to be any motor involved!) Enjoy. 1. Sometimes you need to take a broader view of what it is you seek. In this case, I really did NOT know what these things were. I had to start my searches for things that lift roofs... and work outward from there. 2. When you see a term you don't know, check it out! 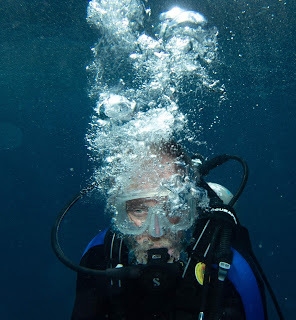 They're often terms (like "strand jack") that lead you to identification of the thing you're searching for. 3. Once you know the term, consider looking for images or videos that show the thing in context. It's an incredibly useful trick to verify that what you're seeing actually IS what you think it is. Next week I'll spare you a Challenge to work on, but I will write a longer note about this particular SRS Challenge and reflect on the past year's worth of research. Update: What are those wheels doing? I went over to the construction site and took a new photo today. It's below. If you click on the image, you can download the original (with all of the EXIF metadata). This wasn't ideal lighting conditions for photography, but I did what I could. I also took my binoculars so I could get a close-up look, and found that the wheels actually have multiple loops of cable wrapped around them. The yellow boxes (one per wheel) seem to be motors that drive the wheels (but I'm guessing about that). In this closeup (from another pic), you can see that the wheels are both "tipped inward" towards each other at about a 45 degree angle. You can also see the cables, though it's not completely clear how the cables run from below other than they wrap a bit onto the wheel in multiple loops. I'll try to get better photos later.. Perhaps tomorrow I'll remember my telephoto lens. We'll crack this Challenge yet! 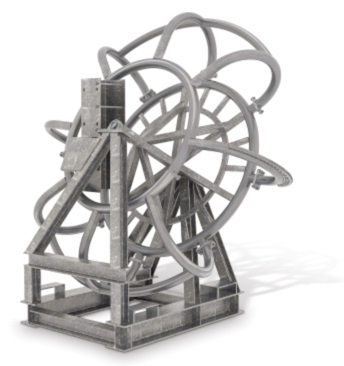 SearchResearch Challenge (1212/18): What are those wheels doing? 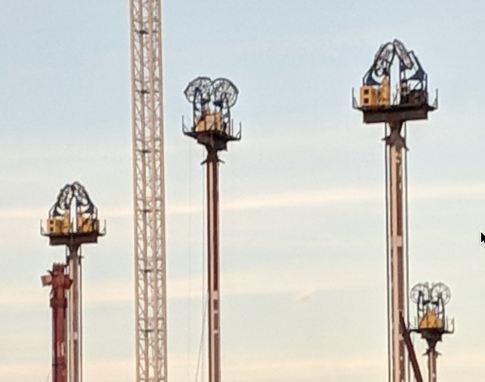 But I was surprised when I went past a nearby construction site and saw number of cranes (or things that look like cranes)--with wheels on the top! The obvious question is "What are these things?" Here's the original picture, and a closeup of what look like big bicycle wheels at the top of several of the vertical posts. Closeup of the wheeled things. The "wheeled poles" seem to have cables running down the sides but that's all I can see. They're mysterious, and therefore perfect for the SRS Crew. Just so you know, I don't have any idea what they are either. All I know is that they're about 20 meters high; each of the wheels seems to be about 3 meters in diameter (but I'm guessing). Beyond that, I can't see any identifying marks or logos. Tell us what you find... and HOW you figured it out! 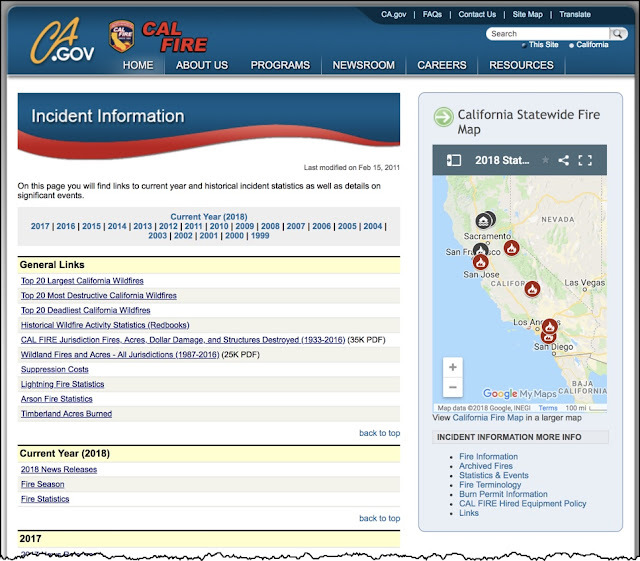 … It's been a wild summer of fire in California. 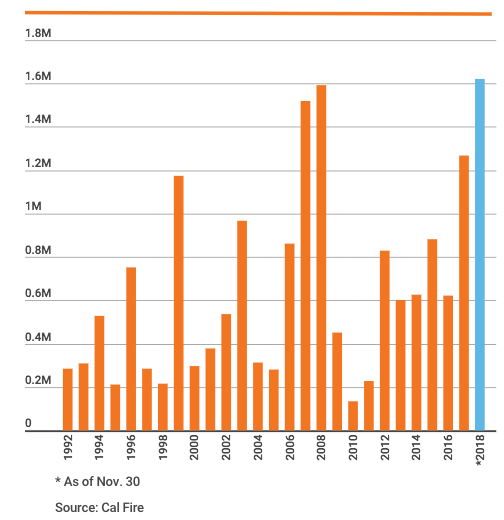 As you recall from the Challenge of November 14, 2018 I posed the SRS Challenge "How many wildfires have there been in California over the past 20 years?" Regular Reader Ramón asked this question, and it turned out to be a really relevant question. 1. 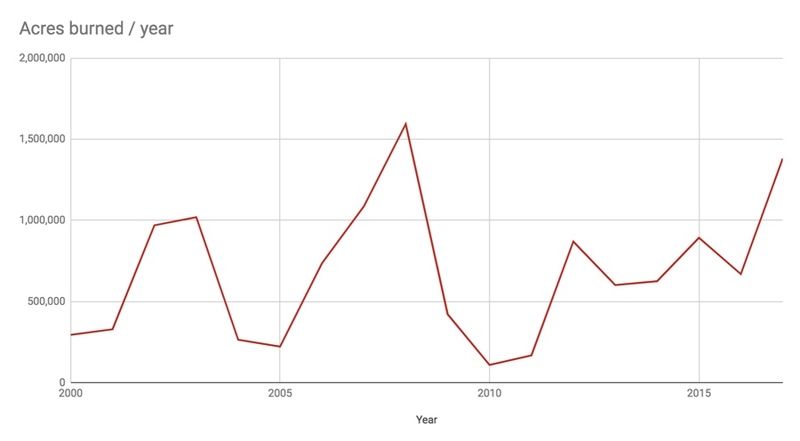 How has the number of wildfires changed over the years in California? Where there more (or fewer) in the past than is taking place now? The first hit is the "statistics and events" data from CDFData.Fire.ca.gov Sure enough--that's pretty authoritative. As you see, it has data going back to 1999 (not quite 20 years, but close enough for our purposes). If you look farther down the SERP results list, you'll see a lot of articles about "California's Most Destructive Wildfires" or "The Deadliest Fires in California's History." We don't want those, we want ALL of the wildfires. So we really want data tables (with good definitions about what constitutes a wildfire -- is a 1 acre grassfire really a "wildfire"?). So I'm willing to go with the CALFIRE data sets. A few clicks down and you land on their accumulated data tables called "Redbooks." These are great resources, but also somewhat dense and FULL of data tables. That's great (if you're doing a report on how fires operate in California), but you have to be very careful when you're pulling data, as we're trying to do here. But I know that some research tasks take time, so I started in, one report after another. 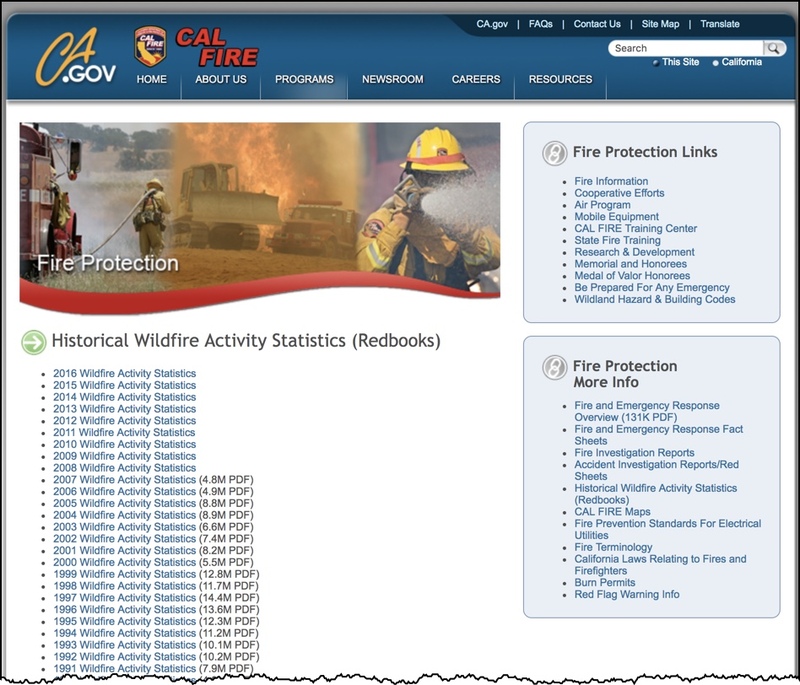 and discovered that someone had already compiled all of the data from the CALFIRE documents! Win! In particular, the section named "Post-2000" has all of the data from the CALFIRE Redbooks. Finding that saved me a bunch of time. 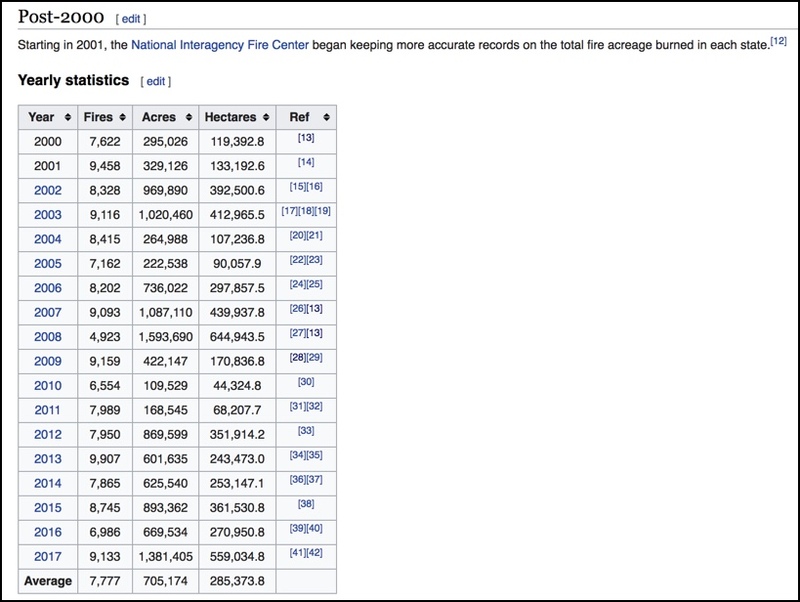 Wikipedia section on California wildfires that compile all of the data by year since 2000. It's pretty easy to copy that data out and drop it into a spreadsheet and create these charts. 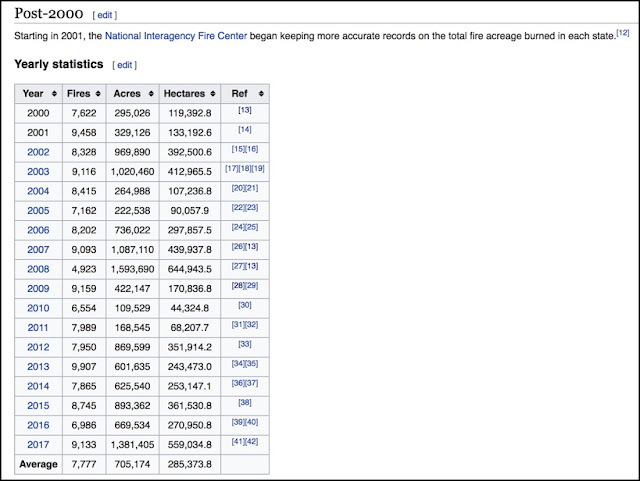 Note that these are both from the CALFIRE data (as reflected in the Wikipedia page). 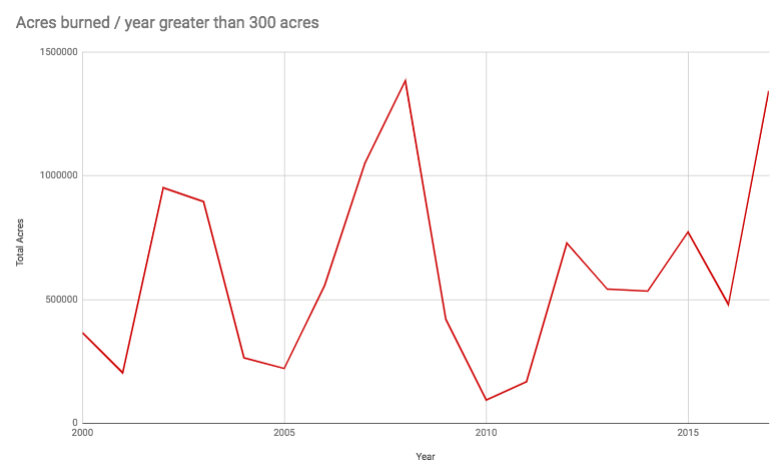 Note that 2008 was a strange year: Fewer fires than average, but more acres burned. Is that data correct? Or is it just a fluke? Well, we have the link to the Redbooks, let's see what they say. The total acreage burned looks pretty much the same (compare the two red lines above), but the NUMBER of fires looks a bit different... especially in 2008. If you look at the top blue line, it seems as though there were fewer fires in 2008 than in other years. But if you drop all of the "little fires" (that is, < 300 acres), you'll see that the number of fires is fairly high in 2008. It certainly looks like the big fires were bigger, and that's what drove the total acres burned to be so high. So, how is this year looking by comparison? I repeated my search from above, but added 2018 to the query. Obviously, the year hasn't ended yet, but given the amount of rain California has received in the past few weeks (129% of normal to date in the southern Sierras), the fire season is mostly over. In particular, I found a web page on the CalMatters.org site that tracks state wildfires. They have this beautiful chart which is consistent with our charts above (makes sense, they're both draw from CALFIRE data), but it pulled the latest acreage reports from the 2018 Redbooks. 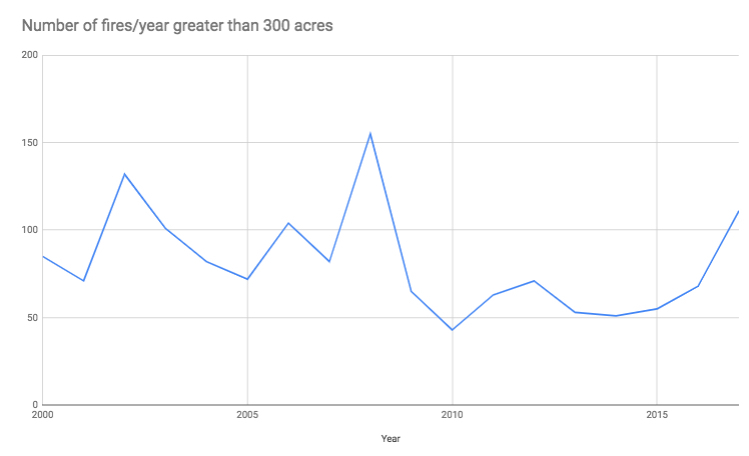 As you can see from this chart, 2018 looks to be just slightly larger than 2008 in total acreage burned. On the other hand, this year was particularly destructive in terms of buildings, total cost, and human lives lost. 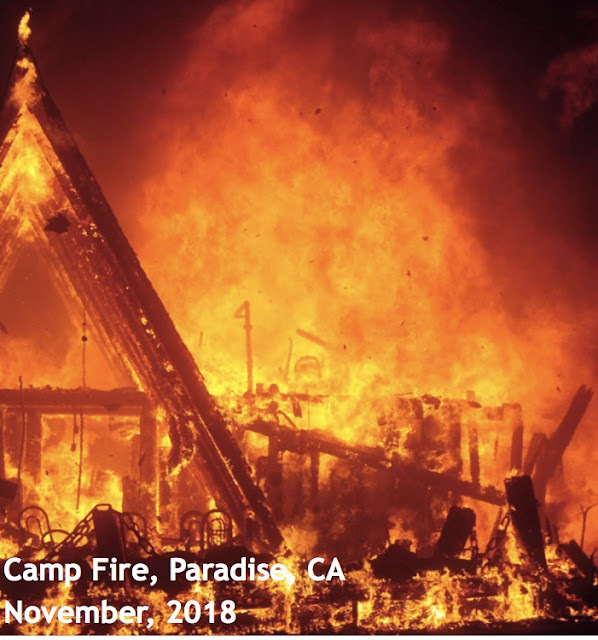 CalMatters also published a chart showing that 2018 was the worst loss of human life in California for the past 25 years, with over 85 deaths, mostly due to the Camp fire in Paradise, CA. 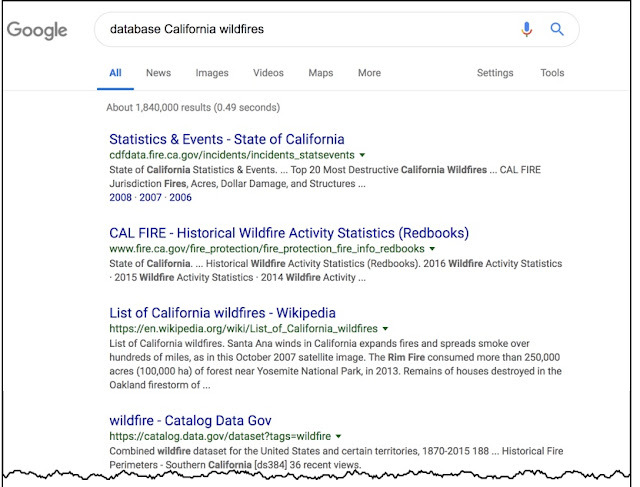 In some sense, this wasn't a difficult search (it didn't take long to find the authoritative CALFIRE data sets in their Redbooks). But it took me a while to pull data from each of them. Luckily, I thought about looking for a site that had already extracted the data from the original source (the Redbooks), and that ended up saving a ton of time. Important point: I DID spot check the data (I checked four different Redbooks, beginning, a couple in the middle, and near the end) to make sure that the extracted data actually came the Redbook sources. This is a good data practice--you want to be sure there are no duplicates or data from tables in the Redbooks that's not quite what you thought. In general, as I was doing this writeup, I found myself eagerly reading stories about wildfire data, and only after pulling the number and comparing them (and then finding them wildly inconsistent with the data I'd already pulled) that's when I'd discover that the data was for some other kind of event. For example, I was very excited about finding a table with all the data I wanted... except the totals were WAY different than what I found in the Redbooks. After carefully checking the data source, I found it was data for the entire country--not just California, which is what I was seeking. 1. Double and triple check your data sources. Be SURE you know what your data is describing. I'm fairly careful, and I caught myself with data errors at least 5 different times. A great practice for this kind of data checking is to walk through it with a friend or colleague. Let them look at what you're doing and double check the data you're using. Most importantly, have them check the metadata (that is, the information describing the data source). Practice safe data handling practices at all times. Triple check yourself (and get a friend to help). What we have here is a failure to search! You'd think that searching to solve a problem would be second nature to me by now. And yet, I didn't do a search last week that I really should have done. Last Monday the front passenger window on my car went down, and got stuck in the down position. Darn it. This is on my Subaru Outback, a nice car, but nothing really special--it's not a high-end car with lots of special gizmos and the like. I use it to carry my gear around and keep me out of the rain. The switch looks like this. Push down to roll the window down, pull up to make it come up. Except that pulling-up thing wasn't doing anything. Speaking of which, did I mention it was raining? Water was coming in through the open window, and I could NOT get it to come up. This is a hassle. Here's the interesting detail: Normally, when I'm sitting in the driver's seat, I can use the switch on the driver's side door to open/close the passenger's window. Makes sense. Except of course, for today--in the rain. I got some plastic and taped it up as much as I could and then made an appointment at the car dealer to get it fixed. Interestingly, I did NOT do a search to try and debug the situation. 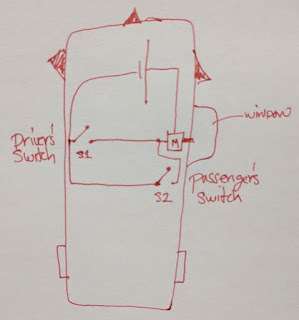 In this quick sketch, if you close either the driver's switch or the passenger's switch, then the motor (M) would turn, and the window would go up or down. Right? But when I used the driver-side switch to bring up the passenger's window, I didn’t see ANY decrease in the car’s overall power as shown on the tachometer (which you would see if power was being drawn). 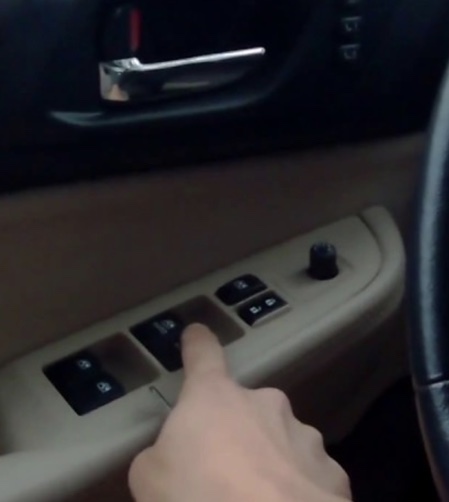 You'll notice this if you try it on your own car; with the window rolled up, if you try to bring the window up, you'll see the power drop as the motor tries to move the closed window. This wasn't happening, and that's how I knew it was an electrical problem. So I drove to the Subaru dealership at 7:30AM only to have the service manager use the passenger-side switch to roll the window up. He got in, pulled-up on the passenger-side switch and the window went up instantly! My mental model came undone at that moment. HOW is it possible that this would have worked? I know switches rarely fail. And I couldn't believe that one switch would work while the other didn't. It's possible (but rare) that just the driver's side switch was broken. Even weirder… once he did that, the driver side switch STARTED TO WORK! 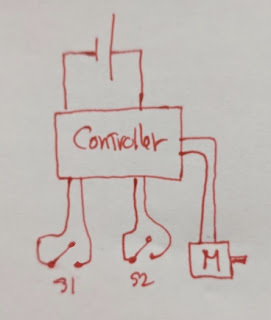 Turns out the switches are NOT wired in parallel, but are both inputs to a master control computer. When the window went down, some glitch happened in the code to prevent an input from the driver-side window from being registered. But the passenger-side switch continued to work. Once the passenger window moved down by using the passenger-side switch, it somehow reset the driver-side switch as well. Very strange. And it completely confused my mental model of how the switches in my car function. What’s more, since my old mental model held that they were wired in parallel, there was no point in even trying the passenger-side switch. But it turns out that’s completely wrong. There WAS value, because they operate independently. 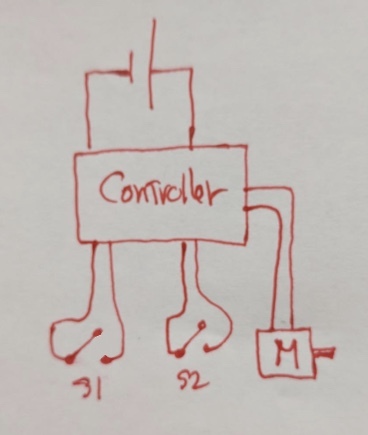 AND if S2 works, then it will reset the controller, letting S1 (Driver's side) operate correctly. In any case, it was a 5 second fix, and I’m out the door. Over a sushi dinner that evening, I mentioned this to my friend Tom who put down his maguro sashimi and instantly whipped out his phone to do a voice search on Google--something to the effect of [ Subaru window no go ] which immediately brought up the Subaru support forum that exactly describes this problem AND the fix! Embarrassedly, I admitted that I hadn't tried this query. Why not? 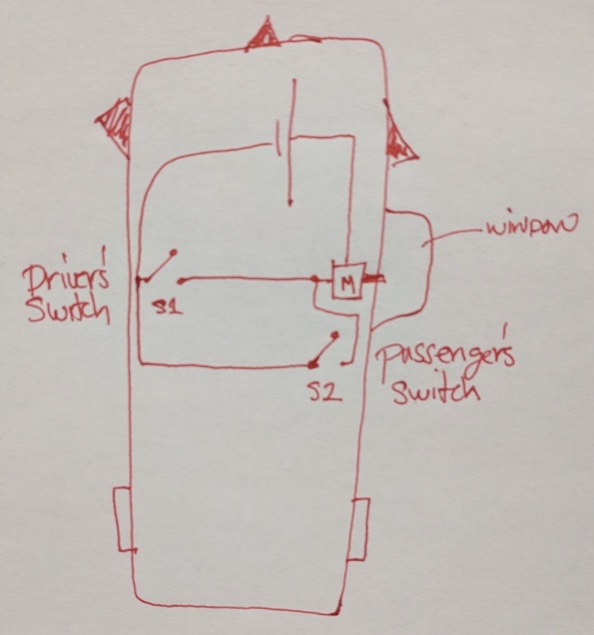 (I can hear you asking...) Because I really believed my mental model of the car wiring was correct, and that trying the passenger side switch was too improbable to work. This is an example of a Dunning-Kruger effect, where my self-knowledge about electronics is fairly high, but the way cars are built now-a-days changed, and I didn't know it. Chalk one up to old-fogeyism! When things get weird, it's worth doing a quick search. Tom found the answer for me--by searching on Google--in less than 10 seconds. If I had done the same, my problem would have been solved just as rapidly... I thought I knew more than I really did. Don't be so sure you know how things work--technology changes, even for things as simple as window switches. Those changes can have a deep impact on your understanding of the world. I'll be sure to look up the next time something like this happens. So believe me when I say... Search on!